The event is fresh: just two weeks ago, a 300-pound (136-kilogram) tigress escaped from its enclosure in San Francisco Zoo, killing one man and mauling other two. “The tiger’s enclosure is surrounded by a 15-foot-wide (4.5-meter-wide) moat and 20-foot-high (6-meter-high) walls, and the big cat did not leave through an open door. There was no way out through the door. The animal appears to have climbed or otherwise leaped out of the enclosure”, stated the zoo’s director of animal care and conservation, Robert Jenkins. The animal appears to have been taunted by people. A famous YouTube movie presents a 2004 tiger attack from India: an animal suddenly jumping from the grass and swiping a man on an elephant’s back (he lost three fingers), at a height of 12 ft (4 m) above the ground! The San Francisco attack comes with the issue: how high can tigers really jump? The American Sanctuary Association, having 35 members, previously recommended 12-ft (4-m) fences in the case of the tigers; now, this will change to 16.4-ft (5-m). The San Francisco enclosure wall was smaller than the AZA minimum height recommended, while major U.S. zoos exceed the minimum, and the walls are even topped sometimes with electrified wire or overhangs impeding the tigers getting out of the enclosure. 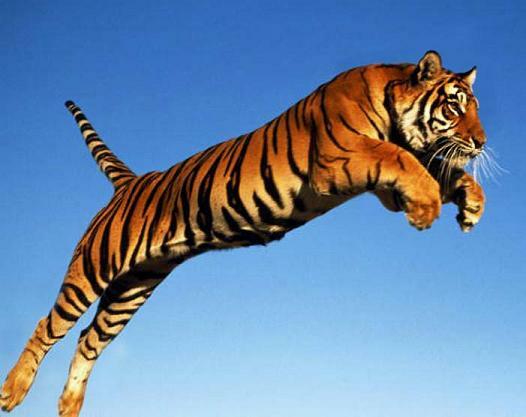 Experts cannot come with a precise value for the jumping ability of tigers. In an 1974 event that took place in a Nepal reserve, a tigress protecting her cubs mauled a researcher who had climbed into a tree. The tigress reached the man with a limb, jumping 15-ft (4.5-m) without much difficulty. “I have seen tigers do many unusual things, such as climbing to the top of large trees when incensed-something tigers don’t normally do. What animals normally do, and what they can do, are often very different things”, said Dale Miquelle, director of Wildlife Conservation Society’s program in Russia (the San Francisco Zoo tigress was a Siberian tiger). Tigers raised in captivity are generally believed not to have the same performances like the wild ones, trained by hunting. “With provocation, they’re capable of unbelievable aggression and power. These cats are a combination of strong instincts, strong emotion and no inhibition”, Louis Dorfman, an animal behaviorist and chairman of the International Exotic Animal Sanctuary in Texas, comprising 24 tigers, told National Geographic News. Zoo visitors running back and forth look like potential preys for tigers; provoking the animals by throwing objects at them or dangling something can wake up in them the fiercest ancestral instincts.